When engaging the work of someone who looms as large as the Hungarian composer Béla Bartók, a number of paths may emerge. One could take on the fact that his research into the musics of Hungary, Romania, and other regional ethnographies presaged the bending of space and tonality by Spectralist composers like Iancu Dumitrescu, Gérard Grisey and Michael Levinas – something which a number of young improvisers have taken into account. Or one could embrace the fact that folk songs are a leaping-off point for structural advances. Yet in jazz, the presence of new music erudition aside folk forms and the blues tends to espouse tension – Ornette Coleman, for example, bristled at the idea his Harmolodic string music had anything to do with Bartók. 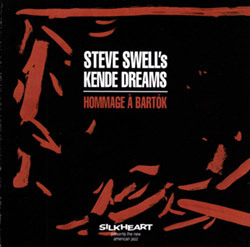 While not entirely resolving this issue, trombonist Steve Swell has used Bartók’s music (with which he had only a passing familiarity) as a foundation for seven compositions featuring the band Kende Dreams (Kende being a spiritual griot-like figure in pre-modern Hungary). For this Hommage à Bartók, Swell is joined by four regular confreres in bassist William Parker, alto saxophonist Rob Brown, drummer Chad Taylor and pianist Connie Crothers. The opening “Roswellian Folk Song” nods in the direction of West African Highlife and the garrulous trombone of Roswell Rudd in addition to taking a circuitous route through triangulated counterpoint, Crothers’ splayed dissonance giving a brittle European-ness to the whoops and sinewy elisions from Swell’s horn. Crothers is often associated with the Tristano school and builds rhythmic knots into shaped canvases of uncommon texture. One doesn’t need, meanwhile, to comparatively listen to Bartók’s Fourth String Quartet to get a charge out of “After SQ4,” which leads off with the luminous coils of Taylor’s kit and extends into the elegant, slashing slink and pirouettes of Brown and Swell before their paths diverge in parallel shimmies, while “Attack of the Mikkrokosmos” hinges primarily on robust duets – trombone and piano, alto and bass, swipes of piano and kalimba, the interplay of both horns — that build off of one another with increasing depth and complexity. On Hommage à Bartók, Swell and his cohorts have created a spry and individual take on the improvised language of human interaction, whether drawn from folk musics or rigorous study. This music doesn’t presage the necessity of knowing Bartók well to get a healthy dose of fresh expressionism and rigorous play out of the listening experience.